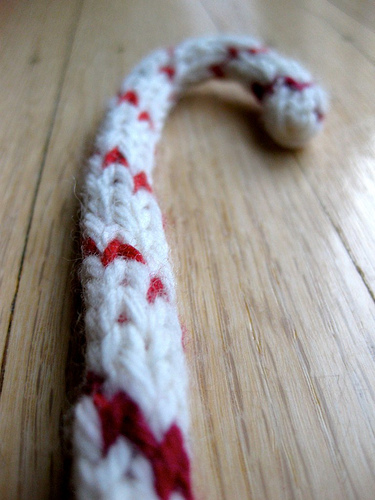 To fill pocket 8 in our Advent calendar we are going to revisit a popular ornament Susi created last year, the knit candy cane. These candy canes will last for years and won’t tempt you from adding to the holiday pounds. Since this doesn’t need to fit anyone gauge doesn’t matter. 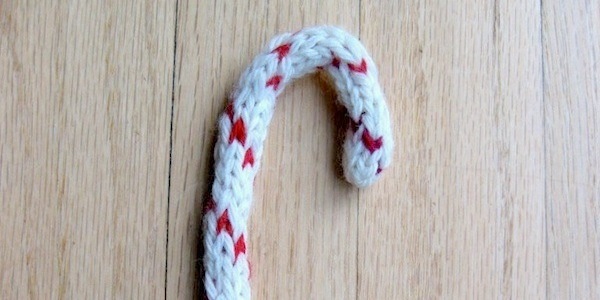 It will differ depending on the yarn you use, thinner yarn=smaller candy canes, thicker yarn=bigger candy canes. Repeat until you have a cane as long as you would like. When the cane is the length that you are happy with, then cast off. The cast off stitches will look like a straight line. So you will need to weave in the tail. Take the tail, and begin by weaving in the stitch opposite of where the tail is, to form the last row into a tube. Sew through all the stitches, gathering them up. Then bury the yarn in the middle of the chord itself. To give the cane a little structure, I took a piece of wire, and carefully (slowly, carefully) stuck it into the middle of the i-chord.) I used a wire that is about as ‘firm’ as a pipe cleaner. If you are feeling really dextrous, you could knit the piece of wire INTO the i-chord as you are knitting. 7 years ago by Kat in Advent Calendar Project , Christmas , Holiday , Knitting , Knitting Projects , Needlecraft , Projects | You can follow any responses to this entry through the RSS feed. You can leave a response, or trackback from your own site.